Pictured are riders in a past bike ride fund-raiser for the Simon Kenton Trail. On Sunday, September 9, riders can enjoy Ohio’s best bike trail and help to pave several more miles of it at the same time. 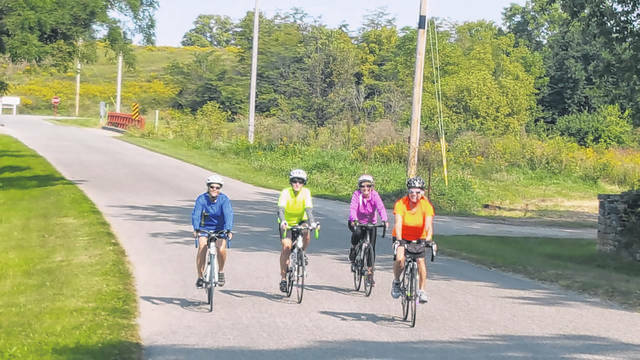 Bicyclists, walkers, runners, and roller-bladers are invited to the 19th Annual Bike Ride from 8 a.m. to 2 p.m. on the Simon Kenton Trail, which runs through Champaign, Clark and Logan counties. The 32-mile shared path was voted Ohio’s best bike trail by “Ohio Magazine” readers in 2018. The goal of Sunday’s ride is to make the Simon Kenton Trail even better. All proceeds will support trail maintenance and the chip-seal paving project of the trail from state Route 296 north to as far as the funds can go – possibly to Township Road 199 in Logan county. This will complete the chip-seal of the entire compacted stone trail. Last year, the trail was chip-sealed from the City of Bellefontaine south to Logan County Township Road 199. This year, every dollar raised by the ride will be doubled thanks to a challenge by Honda of America Foundation. Honda will match dollar for dollar, up to $25,000, what Simon Kenton Pathfinders collects from donations and fund-raisers by November 30. Sunday’s bike ride is family-friendly with three different ride lengths (Metric Century, Metric Half Century, or 15-Mile Fun Ride) to match your fitness level. Registration for the event is at The Depot Coffeehouse in Urbana. Cost is $25 for adults, $15 for children ages 3-12, and free to kids under 3 years old. The fee includes a continental breakfast, a full lunch including bean soup and cornbread, as well as drinks and snacks throughout the day. This year’s ride honors the memory of Rita A. Larson, an avid rider throughout her life and a supporter of the trail. The Simon Kenton Pathfinders is an all-volunteer group founded in 1997. The initial 17 members wanted to develop a shared-use path in Champaign County. The group has grown to 300 members, whose work has expanded the trail to Springfield in Clark County and Bellefontaine in Logan County. Besides being the best bike trail in Ohio, the Simon Kenton Trail holds another distinction. It continues to Springfield, Ohio, where it connects to Cincinnati for a total of 109 miles, making it the nation’s largest paved trail network. Information from Simon Kenton Pathfinders.